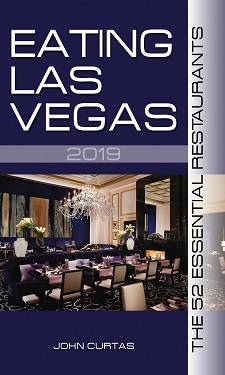 As ELV’s loyal readers know, if you want to keep up with what’s new on the Las Vegas dining and restaurant scene, the best way to do so is to read this website. But occasionally, our good friend, best-selling author/food maven/world renowned restaurant/wine critic John Mariani asks us to chime in on his Website, which we recently did as you’ll see by clicking here…or by continuing to read after the break. Nobu Matsuhisa’s new Nobu in Caesars Palace is the perfect example of what happens when a celebrity chef sells out and uses Las Vegas to cash in. It is the gastronomic equivalent of a once-innovative cook deciding to abandon his legacy to the highest bidder and spend his retirement padding around his culinary house in a succulent silk robe and savory slippers. You will eat well here, if you keep things simple, but you will also feel like you were backed over by a Brink’s truck when you get your bill. This Nobu is 325 seats small, with a menu longer than my last divorce decree. The 166-item (yes, I counted), 4-page menu is all over the map, running the gamut from a tiny cylinder of underseasoned yellowtail mush topped with good caviar ($28) to “Inaniwa Pasta with Lobster” that will set you back a cool $34 for four chunks of lobster atop thin udon noodles. Almost last and definitely least are the “Nobu Style Taco(s),” priced at ten bucks per for teeny tiny tacos containing just enough fish to satisfy the tariff. None of this would matter if they tasted like anything other than the flaky shell that surrounds them, but they don’t and you will feel hosed. There are usually no less than ten sushi chefs on duty, a half dozen hostesses, and so many waiters they need a traffic cop at the delivery stations to keep collisions from happening. Of course, this is nothing new for a celeb chef opening in Vegas. In their first month of operation, casino restaurants typically load up with roughly double the staff they will need once the shakedown cruise is over. The amazing thing is that some of the food, like the sushi, is a lot better than it has to be. It is top drawer, expertly cut and served on beautiful, barely warm and barely held-together perfumed rice. There’s no slack in the sashimi, either. Whether this level of quality holds true once the opening hubbub dies down (and once there aren’t ten sushi chefs manning the counter) remains to be seen. But in the meantime, you will eat some of the most pristine fish you will ever find 250 miles from the nearest ocean. Tempura fans may swoon over the crispy, barely-there batter that envelops the “King Crab with Amazu Ponzu,” and it’s hard to fault. If you seek a flavor depth charge, the mixed toban-yaki (ceramic-grilled) seafood ($32) fills the bill with grilled fish and lots of big vegetables sharing a bowl with a sauce so good you will ask for a spoon. Once you get past those, your tariff and disappointment will mount quickly. Order the spicy scallop hand cut roll ($12) and you will get a panatella-sized roll of rice containing an itty-bitty piece of scallop and zero spice. The same holds true for the Big Eye tuna with asparagus roll ($12), both indistinguishable from something you’d pick up at a supermarket. What you might call yakitori, this menu calls kushiyaki. Either way, it’s simply grilling something-on-a-stick, and either way, there isn’t enough protein offered on the chewy-but-tasty squid ($13) or the dice-sized pork belly ($14) to satisfy even the most modest appetites. Finally, there is the sake list — nine of them, all from the same producer in the Niigata prefecture. Only one of the nine offerings is priced at $75 for a 500 ml bottle, and things get stratospheric very quickly after that. Suffice it to say that reducing your list to a few offerings from a single, expensive producer is the equivalent of Joël Robuchon stating he will only serve classified growth Bordeaux with his food. But I guess when the time comes to cash in, you can do these things with a clear conscience. Nobu is open for dinner only seven days a week, from 5pm-11pm. Prices start at $5-$12 per piece for sushi/sashimi and average $40+ for entrees. For all the noise that Nobu is making on the Strip, it is in the neighborhoods where most local palates are turning these days. After decades of starving for anything other than franchises and mediocrity, Summerlin (Las Vegas’ most affluent neighborhood) has had two new arrivals within a few months and a half mile of each other. both have been packed since opening day. Honey Salt is the brainchild of über-restaurant consultant Elizabeth Blau (below) and chef-husband Kim Canteenwalla, with exec chef Joseph Zanelli (below). Everything from its shabby-chic décor to its farm-to-table menu is designed to appeal to the downward mobility of most diners in this second decade of the 21st Century. Honey Salt’s menu does try too hard to be something for everyone (scallops, salmon, chicken and beef, etc. ), but if you know where to look, there are gems to be found. A shot of “Green Goddess Juice” may be expensive at seven bucks, but seems to possess mystical, health-giving properties. You’ll swear you feel better after the first swig. The New England Fry — basically clams and calamari — suffers from not enough lemon in the aïoli, but otherwise it’s a crispy evocation of everything fried seafood can be. But the real winners on the apps list are the turkey meatballs topped with fresh, grated horseradish, and the aggressively-spiced Tuscan cannellini bean soup — both as deeply flavored and well-constructed as any starters in town. Things get dicier when you venture to the main parts of the menu. My burger has been overcooked and under-seasoned both times I’ve tried it, and the same dullness permeates some of the cooking. It almost seems like Canteenwalla (a chef with major chops) has decided to dial back the seasonings on everything for fear of offending someone. I’d wager even his Nana– after whom the excellent (if somewhat mild) chicken curry is named — would implore her grandson to turn up the heat. As for the vaunted Biloxi Buttermilk Fried Chicken, it operates under the same handicap. In this back-to-basics time, things like burgers and fried chicken need to be either over-the-top or life-changing to be considered anything but an also-ran. This one is merely good, and therefore suffers for it. In a similar vein, the Farmer’s Toast(s), both heaped with fresh veggies and cheese but are so bland and boring you’ll forget you ordered them even before the check arrives. In the chef’s defense, he deserves kudos for at least trying to jazz up vegetarian food, à la ABC Kitchen in NYC, and the healthful items on this menu are as ambitious as any in town. A few good beers are on hand, the wine list is small and reasonably-priced, and of course, there’s the ubiquitous “house-made,” “hand-crafted,” “artisanal,” blah blah blah cocktail list that makes one yearn for a well-made Harvey Wallbanger. Honey Salt isn’t just a restaurant; it’s a “concept.” Which means it is a template for what the investors hope will be a chain or franchise down the road. For this reason, everything on the menu is geared towards pleasing everybody. That’s why all the buzz words are there — “comfort foods!” “grain power!” “farm-to-table!” and why the swells and Summerlin’s ladies-who-lunch love it just fine. But as Moliére observed, “The friend of all mankind is no friend of mine,” and I’d be a lot friendlier towards Honey Salt if Kim and Elizabeth let ‘er rip and tried to make a statement with their food instead of trying to avoid hurting anyone’s feelings, or offending anyone’s palate. Honey Salt is open for lunch and dinner, seven days a week. Lunch entrees run from $9-$22 with dinner prices ranging from $8-$15 for starters and $18-$32 for main courses. Poppy Den is also on a quest for a successful brand (a New York offshoot is in the works) — but chefs know where the spice cabinet is. Top Chef contestant Angelo Sosa proudly struts his stuff as a Jean-Georges Vongerichten acolyte and demonstrates his fusion training with all sorts of familiar goods tweaked with the spicing and techniques of Southeast Asia. The best damn soup in town might be his tomato bisque with curry foam, and it’s hard to fault his ultra-crispy “General’s Chicken Wing” — lacquered with sweet, viscous soy sauce — and finishing on the palate with the subtle-yet-strong heat of this Korean bar food mainstay. Less successful among the small plates are the seared pork dumplings, which resemble frozen, fried egg rolls and not the potstickers they’re described as. And Aunt Carmen’s Fish Fritters (what’s with all this homey menu nomenclature?) that no one will ever mistake for a Thai fish cake, these being tiny balls of deep fried mush, i.e., all filler and little fish. Sosa’s meatballs are miniscule but his tuna deviled eggs are are a nice way to jazz up the overplayed “tartare,” in this case mixing raw fish chunks with a separate salad of hard-cooked whites tossed in a “deviled” dressing. His sweet and savory “fried rice” quinoa with dried pineapple is also a winner, as is his roast duck with bok choy, but the ballyhooed “poppy fries with kim cheese sauce” are so tepid in taste and texture they could pass muster at an old folks home serving pre-chewed food. Things improve immeasurably once you get to Sosa’s meat and fish offerings. Pork belly may be the cupcake of the savory world, but he crisps his to a fare thee well, and his miso salmon is a worthy homage to Nobu’s iconic dish. Desserts tend to be de-constructed riffs on classics, like his strawberry shortcake with housemade ice cream in a clear pool of strawberry syrup. Like the times they are served in, are light, simple, and unchallenging. Many, like yours truly, long for a time when restaurants were started by owners and/or chefs simply looking for a place to cook and serve their food. A time when sugarplum thoughts of “brand expansion” and “franchised success” weren’t the watchwords of this industry. But this is the world we live in, and corporate calculations or not, both Honey Salt and Poppy Den are miles better than anything Las Vegas neighborhoods have seen before. Poppy Den is open for lunch and dinner, seven days a week, with small plates running $7-$14, and large plates ranging between $14-$23. bsite to share our thoughts with his world-wide audience. So we did so, as you can read by clicking here.